I willingly "upgraded" to Windows 10 last year. By the time I figured out that I really didn't like it, I had already passed the 30 day option to roll back to Windows 7. For the last three days Microsoft has had constant pop-ups on my wife's laptop. I had chosen the auto update option to hide the update and allow me to choose what updates to install. Yesterday, there was a "Schedule the Windows Update" pop-up that could not be closed or deleted. 24 hours later the pop-up was still there, could not be closed or deleted. I spent a couple of hours searching the internet to find a way to cancel the update. Microsoft had everything locked down and blocked, so, no access to any choices. I let the update run. Wife will not be happy with 10. I post this to warn everyone that MICROSOFT CAN AND WILL EVENTUALLY "UPDATE" YOUR WINDOWS 7 OS TO 10. I repeatedly read that this scenario could not happen, but I watched it happen. The laptop was hijacked by Microsoft. This seems an invasion of privacy. Who the hell has ever read the entire User Agreement of a Windows program? I am sure that there is some clause in there that allows this kind of access to your computer. I'm researching Linux for my next operating system "update". Sig, I totally buy what happened to you from your perspective. I can tell you - as I manage a whole fleet of these things, that MS does not have the ability (unless auto-allowed one way or another) to push an update to unwilling Win7 laptops. Like you, REALLY not a fan of Windows 8. Windows 10 is perhaps better, but I'm running a good 4 or 5 of these things at home and larger countless number at work and none of them have magically switched. Sorry to hear that yours (wife's) got migrated without your consent. I got a bunch of pop-ups about 10 on our laptop too. I kept declining them. My searching led me to remove some of the windows 7 updates and set them to never re-install, and now the popups are gone and will stay gone. I like Windows 10 - took some time for me to get used to it, but once I did, I like it. Just think, the 21st century started 16 years ago. We're supposed to have holograms - even a holodeck - by now. I didn't think you HAD to upgrade. the offer expires June of this year. I'm all but sure the Win10 upgrade is a willing/opt in thing - not a forced update. The reason I say that is they have an expiration date for the free update. They aren't forcing you to upgrade, because once the free update is gone, they will be charging for it. And Windows 7's end of life probably isn't too far behind the end of the free upgrade. My suspicion would be someone using the laptop hit the accept button on the Windows10 install pop up at one point trying to close it out. This was posted today about the upgrade. I for one like Windows 10, my 12 year old daughter installed it on her laptop when it came out and really likes it as well. However, we are a Windows OS household. Laptops, phones, Xbox. Today Microsoft tried to force feed a Windows 10 upgrade on the computer where I work. We are not ready to do that yet because we need to make sure couple of third party vendor programs will work properly under 10. I left the computer running last night and when I came in this morning there was a blue screen (!) that said something along the lines like "Hi ELB! 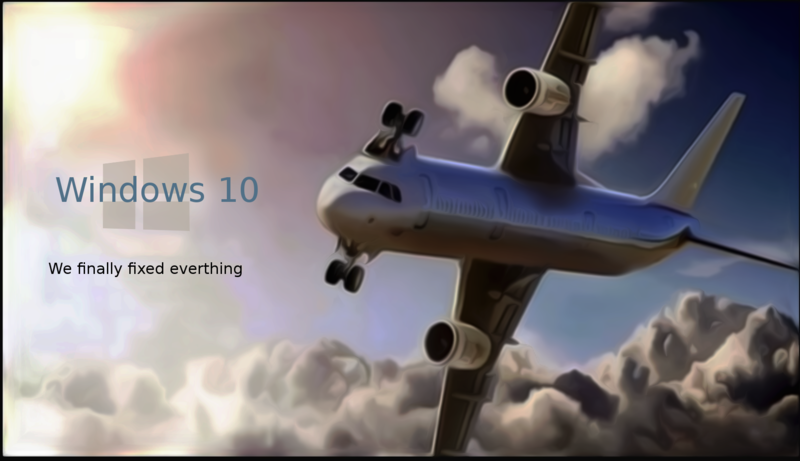 Upgrade to Windows 10!". The only button available was "next" and not even the three-fingered salute could escape it. So I went to next, and maybe another screen, and when I got to the License Agreement I declined. Then I got a message "Restoring previous version of Windows" and that took about 10 minutes. All appears normal now. This is bovine leave-behinds. Microsoft apparently used the auto update function to force an upgrade, and it didn't really give an option to say "No I don't want Windows 10", you have to realize you can sidestep it by declining the license agreement. I don't recall any warning pop-ups yesterday or earlier saying this was scheduled. It just happened. We will upgrade sometime this spring, but we don't need it crammed down our throats. grrrrrr..
ELB wrote: Today Microsoft tried to force feed a Windows 10 upgrade on the computer where I work. We are not ready to do that yet because we need to make sure couple of third party vendor programs will work properly under 10. I left the computer running last night and when I came in this morning there was a blue screen (!) that said something along the lines like "Hi ELB! Upgrade to Windows 10!". The only button available was "next" and not even the three-fingered salute could escape it. So I went to next, and maybe another screen, and when I got to the License Agreement I declined. Then I got a message "Restoring previous version of Windows" and that took about 10 minutes. All appears normal now. I have Windows Vista Home Premium. Still getting periodic updates. It allows me to select the ones I want. Mostly security updates. My old PC is still chugging along. I know it could die any minute. If you have automatic updates turned on (on a Windows 7 or later non Enterprise version), you'll get Windows 10 whether you want it or not. They may turn that on for Enterprise versions too at some point. The installer is probably already on your computer, and Microsoft is using your computer to distribute Windows 10 to others. Window changed 10 to a "recommended" update so it may try to auto install as you have experienced ELB. brhalltx wrote: If you have automatic updates turned on (on a Windows 7 or later non Enterprise version), you'll get Windows 10 whether you want it or not. They may turn that on for Enterprise versions too at some point. So Microsoft is running a Windows 10 bot net? DocV wrote: So Microsoft is running a Windows 10 bot net?